For nearly an year now, me and Firefox have become unseparable. Ever since I started using this browser, I have talked about this browser to hundreds of people. This is certainly the best thing to have happened to the Internet in recent times. 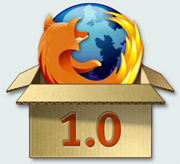 With the launch of version 1.0, Firefox has clearly proved that it is not just a safer alternative to Internet Explorer, but also the most polished browser available today. Doing a Google for Firefox gives 12,300,000 results. That is not surprising. But the real amazing fact is that there is just one result through Google ads, which is an indication of the competition (or lack of it) to firefox at the moment. First thing I did this morning was, checked the Mozilla website to see if the new version is released. No!.. They wake up late in America and it was only after noon (UK time) I found that the new version is out and immediately took the opportunity to download and install it on my computer. There may be some people who are paranoid when it comes to install a new version of a software on the first day itself. But for me that did n’t matter. And I am not dissappointed. My extensions were not affected, expect for IEPreview, which I seldom use. I also had this feeling that web pages are loading a bit quicker. But I have not done any real tests and hence has no evidence to substantiate this. The RSS reader that came with the preview release was buggy and had problems loading my Tamil (Unicode) RSS Feed. I was relieved that this issue has been sorted in the final release. If you have not moved to Firefox yet, do yourself and your computer a little favour by downloading and installing Firefox today. Thanks a lot to all the developers, testers and supporters for this wonderful software. A job well done.